I’ve said it a hundred times. Auburn traveling to College Station scares me. It’s big, it’s loud, they don’t seem to care if they are losing, and it’s still somewhat new. Auburn is now 3-0 in College Station. Auburn appears to enjoy playing in College Station. Think about it. In 2013, they hung with Johnny Manziel, and slung him to the ground in a huge win that catapulted the Tigers into the top 10. In 2015, Jeremy Johnson was a surprise starter, the defense arose to the challenge, and Auburn by two touchdowns. On Saturday, Auburn went in as a two touchdown favorite and left as a two touchdown winner. It could’ve been a three touchdown winner without a late score on 4th down due to a short field from another bad kickoff return late in the game. Let’s start with the offense. Early on, the Aggies were doing everything they could to stop Kerryon up the middle. 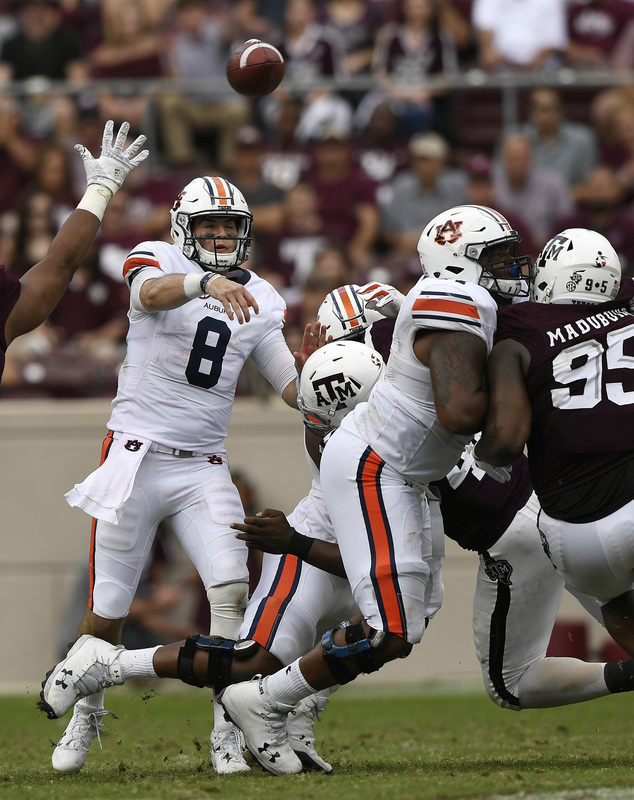 The passing game was okay, but Texas A&M had Jarrett Stidham shook in the pocket. But then adjustments were made. There was some shuffling on the offensive line. Runs started going outside. The deep ball opened up and Stidham had time to throw it. It’s what a good coaching staff does. They see things that aren’t working. They change their approach and they exploit the opponent’s game plan. That’s what’s happened. That said, the first half was still a little too close for comfort. And then the special teams, which hadn’t been very special, showed up. First, Gus did that thing that I love where he uses all of his timeouts right before the half when the other team has the ball in hopes that his offense will get the ball with a minute or so left and just see what happens. This time he didn’t have to see what his offense could do because Nick Ruffin and his College of Engineering self engineered his way through the protection and blocked a punt before what seemed like the entire Auburn roster jumped on it in the endzone. It put Auburn up by eight before the half and it was never really close from there. Now for the defense. They are good. They make stops. They caused a quarterback change because they made about 20 three-and-outs happen in the first half. They gave up one touchdown because of the aforementioned short field from the kickoff return late, but other than that they are very good at stopping teams as a whole. But they will give up a big play. About once a half, someone is out of position or doesn’t wrap up and a small gain turns into sixty yards. That may be a little bit of complacency or knowing that you have 10 other guys playing at an extremely high level. Or maybe it’s just 1-2 big plays out of fifty and it’s okay. It has been okay. I think it will continue to be okay. 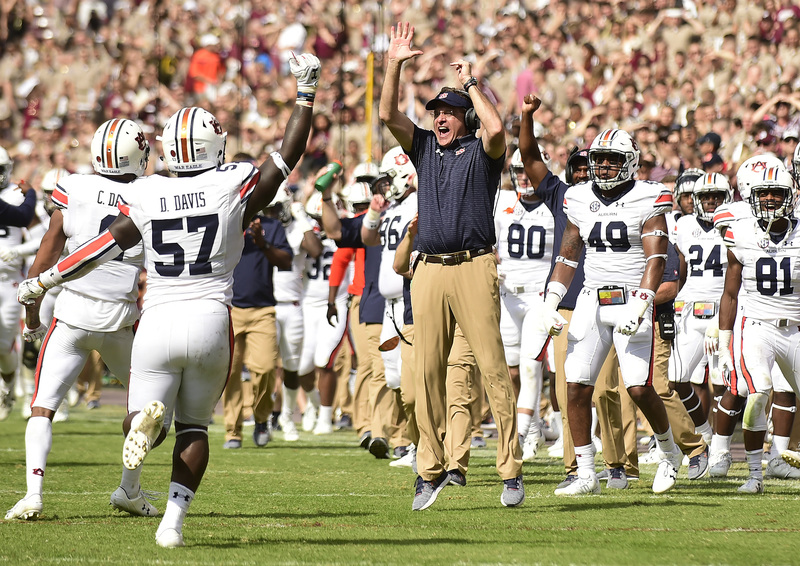 Special teams have been Auburn’s biggest positive the past few years. At LSU, they gave up a game-winning punt return (with 3 blocks in the back). Against Arkansas, they gave up a late kickoff return touchdown (with a blatant block in the back). This past Saturday, they gave up a long late kickoff return. They also had two field goals blocked. Not sure what’s going on there. We know what Carlson can do. Long kick returns shouldn’t happen that often. Maybe it’s a coincidence and they are just happening late in games when the majority of times they really don’t matter. I hope so. Now Auburn is 7-2 and has the world in their hands. If they win out, they may have the playoffs in their future. At worst, they ruin their rivals’ dreams. It will be tough, but if Auburn plays like they have for the vast majority of the season, they can definitely do it. It’s time. It’s Amen Corner time.